How to selectively recover lost messages from iTunes backup to iPhone 6? If you don't have the idea, this article will show you detailed steps to restore messages to iPhone 6 from iTunes backup. I was told in store I needed to restore/wipe my iPhone to get rid of a software problem and should set it up as a new phone opposed to restoring it from an old backup. I've lost all my messages on my iPhone but I know they're backed up on my computer and are on other devices. Is there anyway I can sync/restore all my old messages to my phone without restoring the entire previous backup (i.e. without making it identical to my old phone)? Apparently, what this user needs is to recover old messages to iPhone 6 without restoring the entire iTunes backup. Generally speaking, when you have an iTunes backup for those lost messages you need, if you directly restore from iTunes backup, undoubtedly, the whole iTunes backup data will be restored to your iPhone or iPad, which will erase or wipe existing data from your iPhone. That's why some people need to selectively recover lost messages from iTunes backup to iPhone. So how to recover only messages to iPhone from iTunes backup? Keep reading and below is the answer. When it comes to recovering messages from iTunes backup selectively, without the help from iFonebox, you just cannot make it. 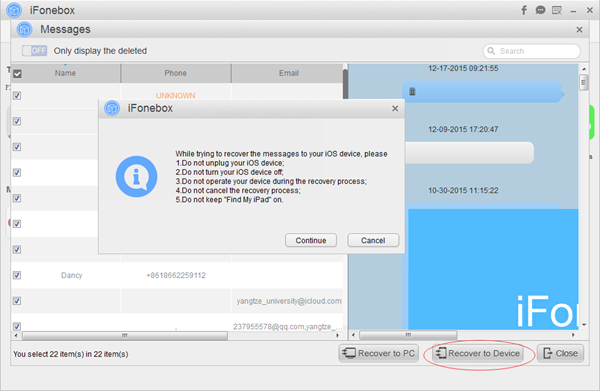 As is known that iFonebox is a professional iOS data recovery software which supports to recover deleted or lost messages, contacts, notes, calendars, WeChat messages, etc, from iPhone, iPad and iPod touch. Plus, it is also a great helper to extract and restore data from iTunes or iCloud backup selectively without wiping any data on your iPhone. One more thing, under the help from iFonebox, you can recover those messages, contacts and notes back to iDevice directly both from device and backup data.So amazing that it is worthy of the best iPhone data recovery. Launch iFonebox. Choose Recover from iTunes Backup mode. All iTunes backup files will be detected by iFonebox, just select one containing your messages to scan. Remember to plug in your iPhone 6 to the computer so as to recover messages back to it. That's all. Now you have selectively recover lost messages from iTunes backup to iPhone 6 directly via iFonebox, convenient and unbelievable.